2008 Presidential Candidate Ralph Nader discusses Obama and “change.” From The Forum Auditorium, Cleveland, Ohio, October 30, 2008. Election Night of the Living Dead – Happy Halloween! “Change” is the mantra of the 2008 presidential election. What’s your breaking point? Don’t be a change zombie – Get out the vote for someone you believe in – Nader/Gonzalez 08. Trick or Treat – this is a fun video to send to your friends for Halloween. From Ralph to You 72 Hours Left. Ralph’s words for you in this most critical period of the 2008 campaign. It’s the last stretch, let’s mobilize. Adam Kokesh: Vote Your Conscience – Vote Third Party! What explains the paradox of the dollar’s sharp rise in value against other currencies (except the Japanese yen) despite disproportionate US exposure to the worst financial crisis since the Great Depression? The answer does not lie in improved fundamentals for the US economy or better prospects for the dollar to retain its reserve currency role. The rise in the dollar’s exchange value is due to two factors. One factor is the traditional flight to the reserve currency that results from panic. People are simply doing what they have always done. Pam Martens predicted correctly that panic demand for US Treasury bills would boost the US dollar. The other factor is the unwinding of the carry trade. The carry trade originated in extremely low Japanese interest rates. Investors and speculators borrowed Japanese yen at an interest rate of one-half of one percent, converted the yen to other currencies, and purchased debt instruments from other countries that pay much higher interest rates. In effect, they were getting practically free funds from Japan to lend to others paying higher interest. WASHINGTON — The Bush administration is poised to suspend lucrative trade benefits to Bolivia in a move that could further worsen tensions between the U.S. and the impoverished South American country. Administration officials say that Bolivia has failed to cooperate in drug control, which makes the country ineligible to export jewelry, textiles and other manufactured items duty-free to the U.S. under the Andean Trade Promotion and Drug Eradication Act. Bolivian officials counter that the threatened action has nothing to do with drug enforcement but is in retaliation for Bolivian President Evo Morales’ expulsion of the U.S. ambassador to Bolivia, Philip Goldberg, last month. The U.S. responded to that move by expelling the Bolivian ambassador to Washington. Venezuelan President Hugo Chavez, a close Morales ally, sided with Morales by expelling the U.S. ambassador to Venezuela, prompting the U.S. to kick out Venezuela’s ambassador. The first part of this video is an anti-McCain ad that I was featured in directed by Doug Liman. The second half explains itself. Is the Monetary System Too Sick to Fix? 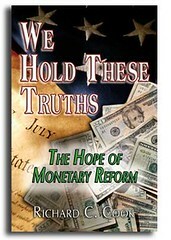 How to reform the broken monetary system. Why the public infrastructure must be rebuilt. The way to create income security for all people. In his visionary approach, Richard C. Cook warns that we could be facing chaos in the streets and a total breakdown of society. Worse, U.S. citizens risk the loss of their core liberties—the Bill of Rights. The alternative is sustainable living through genuine monetary reform. Has the Economic Cancer Spread Too Far, Too Fast? Richard C. Cook was the lead resource analyst at NASA for the space shuttle solid rocket boosters. In 1985, he had written a memo that warned of catastrophic failure, based on meetings with headquarters engineers. He became a key figure in the investigation of the space shuttle Challenger disaster when he leaked a series of memos to the New York Times. His groundbreaking exposé, Challenger Revealed: An Insider’s Account of How the Reagan Administration Caused the Greatest Tragedy of the Space Age was deemed “The most important space flight book in 20 years,” in an Amazon.com review. His career included service with the Carter White House, NASA, and the U.S.Treasury Department. Today he writes articles on economics, geopolitics, and space policy for numerous websites and print magazines. Tendril Press, LLC www.tendrilpress.com. $19.95. Consider multiple copies for holiday gifts! What next for US-Syria relations? Syria has ordered the closure of the American School and the US cultural centre in Damascus. The closures are a response to a deadly cross-border raid carried out on Sunday, October 26, 2008. Damascus blames the US for the attack on a Syrian village near Abu Kamal, close to the border with Iraq. Syria called the raid criminal and terrorist aggression, while Washington called it a successful operation. Eight Syrians were killed in a US raid on the village of Sukariya. We ask: Is the Bush administration trying to make a desperate point in its final days? Is it warning Syria, or is the US foreign policy likely to change with the new administration? Ron Paul: Obama & McCain AGREE with Bush’s Syrian & Pakistan Border Incursions!!! Thousands of people have marched through Damascus in protest at an alleged US raid on a village that Syria says killed eight people. Many at the government-backed demonstration carried banners, shouted anti-US slogans and waved pictures of Syrian President Bashar al-Assad. Riot police surrounded the US embassy in Damascus, which American officials closed blaming security fears. The Syrian government has demanded that Washington apologise for the incident. The US state department and the White House have refused to confirm the alleged attack. lies in the street like a dead snake and you collapse. cool and calm analysis, almost reassuring in its syntactic coherence. in someone else’s voice underwater. But none of the rushing men notice. you were earnestly trying to help. whose voices are in the sirens. and the men and women are running wildly but slowly. is part of the motorcycle that sheared off your arm. Somebody squats down, peers at your face, then rushes on. because nothing sounds like it used to. sucking air from your lungs. Gary Corseri has posted/published his work at Dandelion Salad and hundreds of other venues. His books include: A Fine Excess; Holy Grail, Holy Grail; and, Manifestations (edited). He can be contacted at Gary_Corseri@comcast.net. For several years now, senior officials of the Bush administration including the President and the Vice President have intimated, in no certain terms, that there will be “a Second 9/11”. “[W]e now have capabilities in science and technology that raise the very realistic possibility that a small group of terrorists could kill not only thousands of people, as they did on September 11th, but hundreds of thousands of people. And that has changed the dimension of the threat we face.” (Michael Chertoff, Homeland Security Secretary, Yale University, April 7, 2008. All these authoritative statements point in chorus in the same direction: The enemy will strike again! The presumption of a Second 9/11 has become an integral part of US military doctrine. America is under attack. The US military must respond preemptively. In the immediate wake of the invasion of Iraq (April 2003), various national security measures were put in place focusing explicitly on the eventuality of a second attack on America. In fact these procedures were launched simultaneously with the first stage of war plans directed against Iran in May 2003 under Operation Theater Iran Near Term (TIRANNT). (See Michel Chossudovsky, “Theater Iran Near Term” (TIRANNT), Global Research, February 21, 2007). Franks was obliquely alluding to a “Second 9/11” terrorist attack, which could be used to galvanize US public opinion in support of martial law. “We could blow up a U.S. ship in Guantanamo Bay and blame Cuba,” “We could develop a Communist Cuban terror campaign in the Miami area, in other Florida cities and even in Washington” “casualty lists in U.S. newspapers would cause a helpful wave of national indignation.” (See the declassified Top Secret 1962 document titled “Justification for U.S. Military Intervention in Cuba” (See Operation Northwoods at http://www.globalresearch.ca/articles/NOR111A.html). Operation Northwoods was submitted to President Kennedy. The project was not carried out. General Franks was not giving a personal opinion regarding the role of civilian deaths. He was describing a central feature of a covert military-intelligence operation going back to Operation Northwoods. The triggering of civilian deaths in the Homeland is used as an instrument of war propaganda. The objective is to turn realities upside down. The aggressor nation is being attacked. the USA is a victim of war by the State sponsors of Islamic terrorism, when in reality it is the perpetrator of a large scale theater war in the Middle East. The entire “Global War on Terrorism” construct is consistent with the logic of Operation Northwoods: Civilian casualties in America resulting from the September 11 attacks are used as “a war pretext incident” to galvanize public support for a military intervention in Afghanstan and Iraq. As of 2005, the presumption of a Second 9/11 had become an integral part of military planning. Statements emanating from the White House, the Pentagon and the Department of Homeland Security point to a growing consensus on the necessity and inevitability of a second terrorist attack on a major urban area in the US. In April 2006, the Pentagon, under the helm of Donald Rumsfeld, launched a far-reaching military plan to “fight terrorism” around the World, with a view to retaliating in the case of a second major terrorist attack on America. The presumption of the Pentagon project was that this presumed attack on America by an outside enemy would result in the loss of American lives, which in turn would be used to justify US military actions in the Middle East war theater. The covert support of US intelligence to Islamic terrorist organizations (the outside enemy) slated to carry out the attacks, was of course not mentioned. Various “scenarios” of a second 9/11 attack on the Homeland were envisaged. According to the Pentagon a Second attack on America, would serve an important policy objective. Since 2003, various procedures have been adopted regarding the enactment of Martial Law in the case of a so-called “National Catastrophic Emergency”. Under martial law, the military would take over several functions of civilian government including justice and law enforcement. Initiatives in the area of Homeland Security outlined the precise circumstances under which martial law could be declared in the case of a second 9/11. NSPD 51 is predicated on the notion that America is under attack and that the “Catastrophic Emergency” would take the form of a terror attack on a major urban area. More recently, in May 2008, another National Security Presidential Directive was put forth by the White House entitled Biometrics for Identification and Screening to Enhance National Security (NSPD 59, HSPD 24). NSPD59 complements NSPD 51. The new directive is not limited to KSTs, which in Homeland Security jargon stands for “Known and Suspected Terrorists”, it includes various categories of domestic terrorists, the presumption being that these domestic groups are working hand in glove with the Islamists. NSPD 59 goes far beyond the issue of biometric identification, it recommends the collection and storage of “associated biographic” information, meaning information on the private lives of US citizens, in minute detail, all of which will be “accomplished within the law” (For further details see Michel Chossudovsky, “Big Brother” Presidential Directive: “Biometrics for Identification and Screening to Enhance National Security”, Global Research, June 2008). NSPD is explicitly directed against American citizens, who are now categorized as potential terrorists. While “conspiracy theorists” have been accused of cogitating regarding the possibility of a Second 9/11, most of the insinuations emanate from official US sources including the White House, the Pentagon and Homeland Security. The fact that a “massive casualty producing events” could be used as part of a US foreign policy agenda is diabolical. The official statements are grotesque. While the Washington Post leaked the substance of the Pentagon’s classified documents pertaining to the “opportunity” of a Second 9/11, the issue has not been the object of mainstream commentary or analysis. It is worth noting, however, that in an August 2007 Fox News interview, “A Second 9/11” was heralded as a means to create awareness and unite Americans against the enemy. While Stu Bykofsky’s controversial article in the Philadelphia Daily News (August 9, 2007) was, at the time, considered as outlandish, what Bykovsky was actually saying was not very different from The Pentagon’s ploy (modeled on Operation Northwoods) concerning the role of massive casualty producing events in triggering “a useful wave of indignation”. John Gibson: In big security, to save America we need another 9/11. That’s what one columnist is advocating as a way to unite America. Nearly 6 years after the heinous terror attacks he says we have forgotten our enemy. He says the Iraq war has divided the US, the Republicans and Democrats are on the attack over the war, we pulled together after 9/11 but he justifies his controversial statement by saying the united front just didn’t last. And now, bloggers are outraged. Some say the journalist should be fired from his job for suggesting we, quote, “need” another attack. So is this just a means to shock or offend or does this columnist actually have a valid point? Well, he’s here now live to explain: Philadelphia Daily news columnist Stu Bykofsky. So Stu, let me… let’s just say it again. What do you say America needs at this point? Stu Bykofsky: Well, my thesis here is that we’re terribly divided, there’s disunity in this country, and as a divided country we’re weak. When I look back over what has pulled the country together over the past few years, 9/11 united the country and it remained united and we were all on the same team for at least a year or two. John Gibson: Stu, but do you mean to say that we are going to be attacked again, we will be united again, there’s a sort of inevitability to that or that in order to achieve this unity we actually need to suffer? Stu Bykofsky: Uh, John, I didn’t actually call for an attack on the United States. Uh, I can see where people read it that way but I didn’t actually say it. However, another attack on the United States is inevitable. I believe that, don’t you? John Gibson: …is the word “need”. If you say, well, it’s gonna happen and it, you know, Americans are gonna die because we’ve let down our guard – one thing – but when you say we “need” an attack it… especially has riled relatives of the dead. Stu Bykofsky: John, uh, I can understand them being upset. Are you reading from the headline or from the text of my column which I don’t have in front of me? John Gibson: Well, that’s a good point. Did you use the word “need” in the text or was it only the headline? Stu Bykofsky: It’s the headline. John Gibson: So you don’t actually, you don’t endorse the word “need”? Stu Bykofsky: Uh, no, I don’t. There was a slight difference. Other people write headlines and it’s not exactly what I was trying to say. John Gibson: But, but what you are trying to say is, is that, that somehow we have been, we’ve let down our guard, we’re fighting each other instead of the terrorists and that if we don’t get it together people are going to die. Stu Bykofsky: That’s absolutely correct. We’re fighting like a group of rabid dogs and our attention should be turned elsewhere. And I also say that the primary reason for that in my opinion is the, uh, the war in Iraq which has been conducted so horribly by the administration. Stu Bykofsky: Not by our troops. John Gibson: Yeah, okay, I don’t want to get you in further trouble. Stu, uh, what has been the reaction? Did the newspaper switchboard light up? John Gibson: A bunch want you fired, right? John Gibson: A bunch of those e-mails want you fired, right? Stu Bykofsky: Uh, a number of people told me that they were calling my editor and they were going to suggest that he fire me, yes. I don’t think that’s going to happen. John Gibson: You standing by the column? John Gibson: Stu Bykofsky, down in Philadelphia. Stu, thanks a lot. They found Sarah Palin in the wild, taught her everything, and set her loose, but they forgot one thing: she couldn’t be contained. Israel and Iran: Which country comes foremost in US foreign policy, the United States or Israel? Sometimes it’s hard to tell. The Israeli-centric approach to US Middle East foreign policy, which is unfair to the Palestinians and dangerous to a United States dependent on foreign oil, will not change in an Obama Administration. Which country comes foremost in US foreign policy, the United States or Israel? Sometimes it’s hard to tell. The Israeli-centric approach to US Middle East foreign policy, which is unfair to the Palestinians and dangerous to a United States dependent on foreign oil, will not change in an Obama Administration. Which office is Obama running for? I want you to know that today I’ll be speaking from my heart and as a true friend of Israel. And I know that when I visit with AIPAC, I am among friends. Good Friends. Friends who share my strong commitment to make sure that they bond between the United States and Israel is unbreakable today, tomorrow, and forever. Understand that Zionism is a political philosophy and is not the same as Judaism, which is a religion. One does not have to be Jewish to be a Zionist. In fact, Christian Zionists are prominent as supporters of and elected officials from the Republican Party.3 Some Christian Zionists, particularly the Dispensationalists,–the late Rev. Jerry Falwell was one–want Israel to claim all of Palestine because they believe that this is a necessary precursor to the Second Coming of Christ.4 However, these Christian Zionists also believe that the Jews and all other non-Christians will be condemned on Judgment Day. So they don’t have any particular love for the Jewish people.